If you don’t move your legs enough, your brain grows weaker. That’s the finding of a new study published last month in Frontiers of Neuroscience. The study took two groups of mice. One group had full mobility. The other had their hind leg use restricted for 28 days (the study authors emphasized that these mice continued to eat and groom normally and did not exhibit stress as a result of being so hindered). After 28 days, the researchers examined the area of the mice’s brains that is responsible in all mammals for maintaining nerve cell health and where neural stem cells produce new neurons. They found a 70 per cent decrease in the number of new neural stem cells produced by the hindered group of mice versus the free range group of mice. 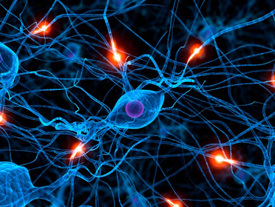 Some types of specialized neural cells failed to fully mature. This study demonstrated that making use of those big leg muscles is key to spurring the proper development of the neural cells that are essential for a healthy brain and nervous system. Signals sent by muscles to the brain are just important as signals sent from the brain to the muscles. In other words, we are meant to run, walk, squat, lunge, lift, and all those other activities that recruit the legs and the core. If we don’t, it can spark a cascade of negative health effects. For us as Chiropractors, this study is yet more evidence of the brain-body connection—an area that still holds many mysteries for scientists to unravel. But one thing is certain: When this connection, this channel of communication (via the spinal cord), is disrupted or impeded in anyway, it can contribute to a number of health problems and lead to changes at a cellular level. It’s a bit simplistic by today’s standards, but it makes the point about Chiropractic (no pun intended) and does resonate with the findings of that new study. Consider the head of a safety pin as your brain. The other end – the coiled wire – is a cell, any cell, in your body. The wires in between are the paths of communication through your nervous system that are connecting the two. This communication must flow in both ways. When the safety pin is opened, this two-way communication is no longer possible. It’s like an email program that can send but no longer receive messages. In our context, we call this disruption in communication a subluxation – a misalignment of the vertebrae in your spine, perhaps several, is adversely affecting the nervous system. Similar to the flow of water being interrupted when a garden hose is pinched or kinked. Pain is often a symptom of a subluxation and pain relief is often a positive side effect of care. This being said, our goal isn’t to treat the pain, the symptom, but the underlying cause, which is the subluxation. By doing so, we ensure an optimal brain-body connection. This will help ensure you are in the best health you can be overall. But as that recent study suggests, we can only do part of the job – you must do the rest. Be active, be healthy, and give those big muscles the exercise they deserve and that your brain needs.